This is essentially two stories in one book. The bike used was a BSA Bantam, a 1952 model. This was originally fitted with a 125cc engine; however for safety it was modified by fitting a later 175cc engine, in order to give the bike a little extra speed to help keep up with modern-day traffic. Firstly, the book relates to Gordon’s failed attempt to reach Egypt when the little Bantam died in the top end of Italy. Undeterred, several months later, Gordon set out again, and this time he was successful. 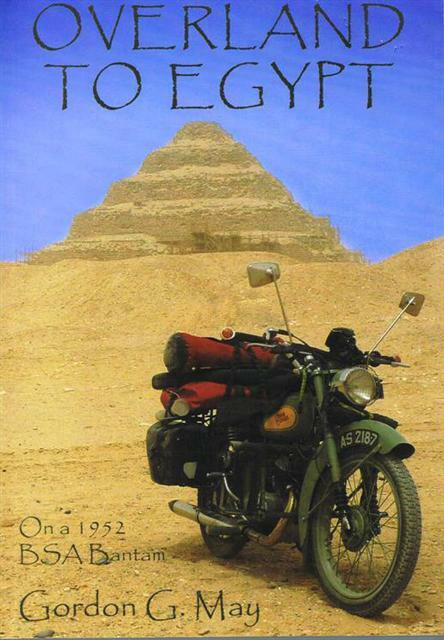 Travelling through to Egypt the bike suffered because of the extreme heat in some countries. Gordon got proficient at fixing the machine, and luckily he met some very helpful characters en route. He visited several interesting places on his journey; one such place was a town called Petra, ( see www.overlandtoegypt.co.uk ) In about 10 bc to 40 ad this town had a population of roughly 30,000, including hydraulic engineers who created dams, channels and reservoirs to protect the town from annual floods, and all this without the aid of computers!! This book is a cracking good read. My edition is a soft covered, illustrated A5 size and it is a tribute to Gordon and his determination to get the little Bantam through. Gordon can often be found selling products and books at classic motorcycle shows.